Cyclone scrubber polishers, the unique Cimex triple brush system means unbeatable performance, ease of use and increased operator safety!! 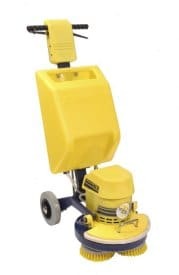 Cyclone scrubber/polishers are multi-purpose machines suitable for cleaning and polishing virtually every type of flooring from concrete to wood, vinyl to carpet or rubber to tiles. The whole machine is very stable and due to the contra-rotating action of the brushes, cables are naturally deflected away rather than potentially snagging into the machine. As there are always two wheels on the floor at any time, they are easy to manoeuvre, while the belt drive means that they run very smoothly and quietly. Applications: scrubbing hard floors, polishing & spray cleaning of vinyl & ceramic floors, carpet shampooing, cleaning uneven surfaces – e.g. studded rubber, tiles etc. This machine is suitable for use in commerce and industry.